If you are a homeowner, you have probably been given a lot of advice over the years. When it comes to your home heating system, you have probably received the same bit of advice over and over again: to schedule regular, professional heating system maintenance with your local service provider to ensure the continued efficient and effective performance of your home heating system. Well, don’t expect that bit of advice to stop being offered anytime soon. Quality Air Heating and Air Conditioning has been providing high-quality heating service throughout the Columbus area for years, and we are here to tell you that there is simply no better way for you to keep your home heating system operating efficiently and effectively than with regular, professional maintenance. Even still, chances are that as many times as you have heard this advice you may still not understand what to expect during a heating maintenance visit. Here is an example of some of the important services your heater will receive during this maintenance visit. Hopefully it convinces you to take proper care of your heater in Columbus. To begin with, your entire heating system and all of its components will be inspected for proper operation to ensure that it is performing its function safely. This includes a detailed inspection of such heating system parts of your heat exchanger. The heat exchanger in your heating system is an integral part of the machine and must perform properly for your home to be adequately heated. Its condition must not be compromised in order for it to operate safely, though, as well as effectively. Any rust or corrosion on your heat exchanger can present a serious health risk, as it can allow for carbon monoxide to leak into your system and throughout your home. Carbon monoxide is a colorless, odorless gas and it can be quite deadly if not detected in your home. Regular heating maintenance not only lowers energy bills, it helps keep your home safe. There are a lot of parts to your home heating system, of course, and during a heating maintenance visit they will all be assessed, tuned up and repaired as necessary. This allows your system to work as efficiently as possible, helping to save you money in energy costs. Your ductwork, for example, will be inspected for poor insulation, connections, or damages including leaks. The presence of any of these conditions will allow the heat that you have paid for to go to waste, lowering efficiency. Make sure that the heated air you have paid for is being put to good use with professional maintenance service. 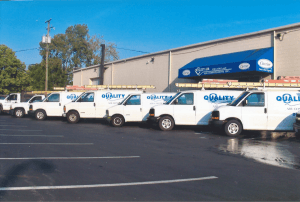 If you have any other questions about the importance of heating system maintenance in your Columbus area home, call the pros at Quality Air Heating and Air Conditioning. We’ll make sure that your home is efficiently and effectively heated this winter. Schedule service today.